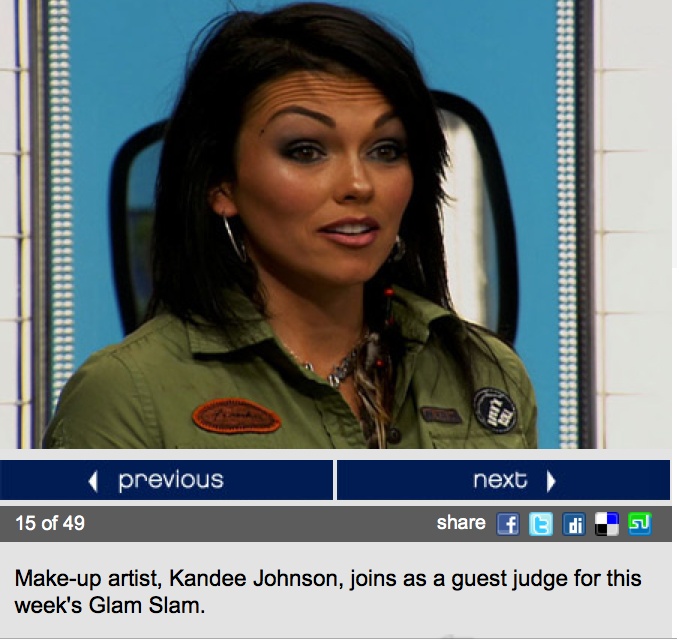 kandeej.com: HURRY WATCH I'm on TV TUESDAY NIGHT!!!! HURRY WATCH I'm on TV TUESDAY NIGHT!!!! YAY! I'm gonna be on TV!!!! Can you believe it!?! I was so honored to be asked to be a part of the show! that's me on the left....I don't own that dress, the stylist gave it to me....I was feeling very elegant! Here is me trying to give "criticism", but to know me is to know that I am always positive and encouraging, so they kept telling me I had to be more critical and mean...when, well when you watch it, you'll see how I just want to tell them how amazing they all did! The hair they did on this show was AMAZING! It was sculpture and art with hair, everyone was awesome! I had so much fun this day, and I loved meeting the make-up artist on the show, Julie Murray...even though I did my own make-up, she awesomely let me borrow her liquid liner to put on my eyebrow "decoration dots" I do! She was my insta-friend! That was such a fun, fun couple days of filming...I wish I could've judges the whole show! Yay! Have fun watching me on the telly (television)....I am gonna be so excited to see it! I hope you are too, we can be watching it together, via the tv! cartwheels and bowls of ice cream, your kandee! PS. this is so awesome, when you read my www.kandeeland.com blog and see how un-glamorous my life is, then see that I get to be in ELLE magazine this month, and this show is airing this month too...I can't believe it- I am SOOOO blessed! yay! squeals of happiness! How exciting my really good friend Amanda Fields is one of the models on that show...the beautiful red head! :) Glad you had a FUN time! So cool! I love that show! You are doing things in life and that is freaking awesome. You give me hope and inspiration! Thank you and congrats! Kandee, Congrats!!! You were meant to be a star... can't wait to watch!! Hope you can show some of it on you tube! Can't watch the show from Australia! I so want to see it.... good on you..
can't wait to see your gorgeous face on the tv! so excited!! Kandee...that's great!! I set a reminder!!! Can't wait to see it!! Yay!! How exciting! I'll definitely be watching!! YEA!!!! So excited for you! Hey as long as the wrinkles don't stay we are OK! lol Congrats! I'm telling you this is only the beginging...Great things happen to great people! Best Wishes! but good luck on it and you'll be so great!!! God Bless and Take care :):) <3 xo. Oh, Kandee! can you imagine how popular you became since last year?? year ago i discovered your amazing videos, and i still enjoy them. but the best thing is that you didnt even change, i mean some people become popular and then they change to the bad side... keep going, keep shining, you're such an amazing and unique person! you became my teacher, my idol... im not sure you'll read this, but im not afraid to say that you changed my boring, living-in-the-shadow life, thank you so much!!! Awwww...congratulations Kandee! U're really an inspiration among the beauty community! OMG! CONGRATS!! HOW FUN!! I LOVE THAT SHOW! 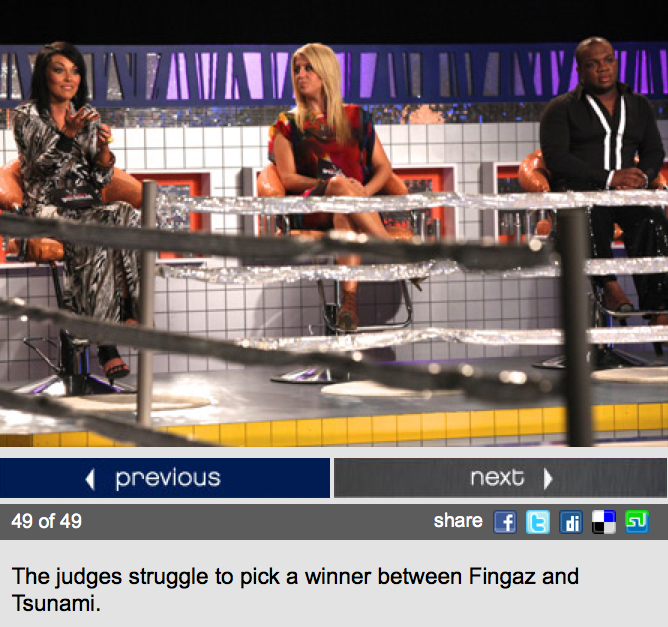 FUNNY THING IS, I SERIOUSLY THOUGHT IT WOULD BE GRREAT IF YOU WERE A GUEST JUDGE ON THERE!! AND HERE IT IS, COMING TRUE! LOL! I AM SOO EXCITED AND HAPPY FOR YOU!! I MOS DEF WILL BE WATCHIN!! YAY!! AWESOME!!! I'm sooooo watching Oxygen tonight! OMG!!! 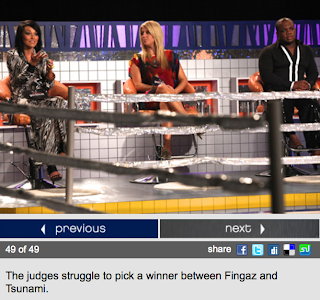 I am super stoked that I get to watch my fav guru on TV =D Congrats, Kandee...mos def looking forward to tonight! WHAT THE HECK I LOVE THAT SHOW CONGRATS ON THIS AMAZING OPPORTUNITY!! SOOOO HAPPPPY FOR YOU!! very cool ! congrats kandee !! Kandee, I can't wait to watch you tonite!!!! YAY!!!! Sooo excited for you & Love you lots!!! I wish I had oxygen! I would love to see you on tv! Congrats! You deserve it. Oh wow Kandee that's great! check you out, I'll make sure to tune in tonight. CONGRATULATIONS!!! THAT'S JUST ONE OF MANY AMAZING THINGS TO COME FOR YOU, HOW EXCITING!!!! Yay! Cant wait, I waych this shhow every Tuesday after Bad Girls Club! (: Your amazing. May God continue to bless you doll! I am soo happy for you! you deserve everything great and more! that's just great, Kandee! Your living proof that dreams do come true!!! Can somebody put it up on Youtube please? I can't access any of the US content in Australia... :( Would love to see Kandee on TV. Lots of love girl! You're such a great role model!!! """"CONGRATS"""" I'M SO HAPPY FOR YOU. CAN'T WAIT TO WATCH!!! Kandy can u give a lil shout out for Rene Aldana who is running to be the next Urban Decay Pocket Rocket Man. It only takes a few seconds to vote. I would really appreciate it. this is the weirdest thing! im was just like omg im watching it now and i come on here to congratuate you and you have a post about it lol well anyway congratulations you look great! I am watching you on tv at this moment!! You look amazing! Doing a great job! - love you! I'm sooo watching it now...how exciting CONGRATULATIONS!!! Holy sh*t! 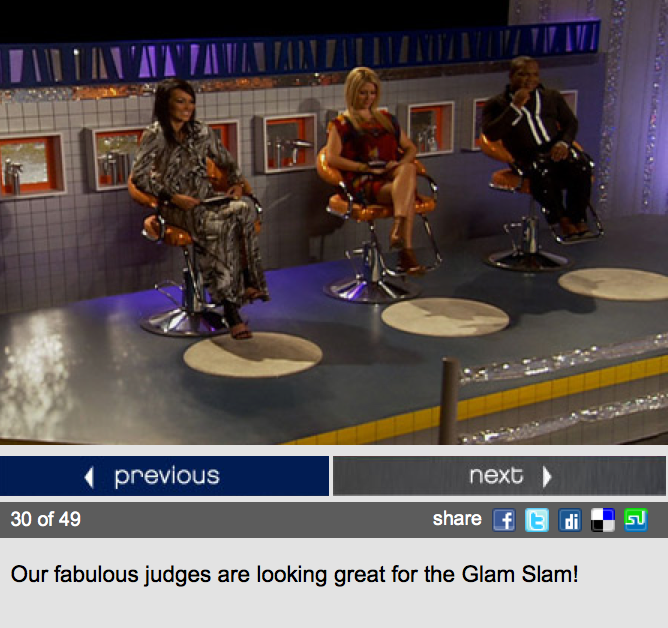 I'm watching my dvr'd Hair Battle & was supristed & thrilled to see you! How wonderful & exciting! Congrats! Hooray! you did amazing! that was SO exciting(: I had my boyfriend on the phone with me so we could watch together haha. You looked So BEAUTIFUL! as always! Great Job pretty girl! I didn't even know you were going to be on there but I happen to be watching it right now. I enjoy this show. Watched it and it was amazing!! Your comments and advice were obviously from the heart.....what an amazing experience!!! I WATCH THaT SHOW EVERY WEEK! IT WAS EVEN MORE ENJOYABLE HAVING YOU ON IT! YOU WERE SO CUTE AND SWEET ON THERE! WHERE DID U GET THAT ARMY LIKE SHIRT! I LOVE IT!!!! YOU LOOKED ADORABLE ON THERE! you did great and looked gorgeous! you can watch the episode on hulu, btw! Me llamo Romina, soy administradora de un directorio web/blog. Tengo que decir que me ha gustado su página y le felicito por hacer un buen trabajo. Por ello, me encantaría contar con tu sitio en mi directorio, consiguiendo que mis visitantes entren también en su web. Kandee, I was sitting there just watching the show... and pow you walk thro the doors on the show... I was like shhhh to my boyfriend. It was really cool to see you on tv... You were amazing and you looked so wonderful !!! I give you big congrats !!! Well hope to see more of you on tv doing contest like such. Loves. First time on your blog. I've been hooked on your you tube tutes: they're that good. I wanted to make a bigger request -namely, have you thought of putting all your best make up looks in a pocket sized book and selling them? ...I would most definetly be buying them and also giving them as presents to girlfriends. ...I'm from Australia; and here at least there are no (easy enough to find, at least) books on how to apply makeup. Cheers! And look forward to seeing more of your stuff. YOU DID SOOOOOOOOOOOOOOOOOOO GOOD ON HAIR BATTLE SPECTACULAR!!! I was so excited seeing you on the show!! You looked AMAZING!! i was wondering if you dont mind... can you explain what you mean my decoration dots for your eye brows its something i never seen on your videos unless i missed it. maybe you can post a video on youtube or something about it... thanks a million i understand if you dont have the time with the cupcake in the oven. I would have loved to see you on TV but I'm sure you did great! My secret to amazing skin! I can't believe this was my DAY!!! How to FLY In STYLE! The MOST GLAM Make-Up look EVER! Yay!!!! I'm in a MAGAZINE!!! The most beautiful thing to travel with! Beware of the UGLY & No's! YAY! We have a winner!!!! Something Special Is Gonna Happen in ATLANTA! The MOST Dangerous thing to put in your pants!